I am lucky enough to have been given some of a wonderfully active sourdough starter by a friend. This is seriously active stuff. I had a starter a few years ago, but the resulting bread was fairly solid, so I didn't use it that often ; the weekly feedings seemed such a waste that we weren't that upset to loose it after one holiday. The bread made with this new starter is as good as bread made with commercial yeast. Although I must say that I hope my bread making techniques have improved in that time too! This morning I thought I'd try out sourdough pancakes and since I had some buttermilk in the fridge from making butter last weekend I made sourdough buttermilk pancakes. I figured that sourdough and buttermilk together would result in quite a tangy pancake that would go brilliantly in a stack with some wonderful, salty bacon and sweet maple syrup. Happily they did just that, a brilliant stack of breakfast! 1 cup of sourdough starter, best if fed the night before so it is good and lively. Mix the starter, buttermilk, olive oil, egg, sugar and salt until well combined, but not too much so you don't develop the gluten and end up with a tough pancake - no one wants a tough pancake! Heat a pan to medium and an oven to low with a foil covered plate in it to keep the pancakes warm. Pour a little olive oil in the pan and then wipe around and off with a paper towel. Use this now oiled paper towel to wipe the pan between pancakes. 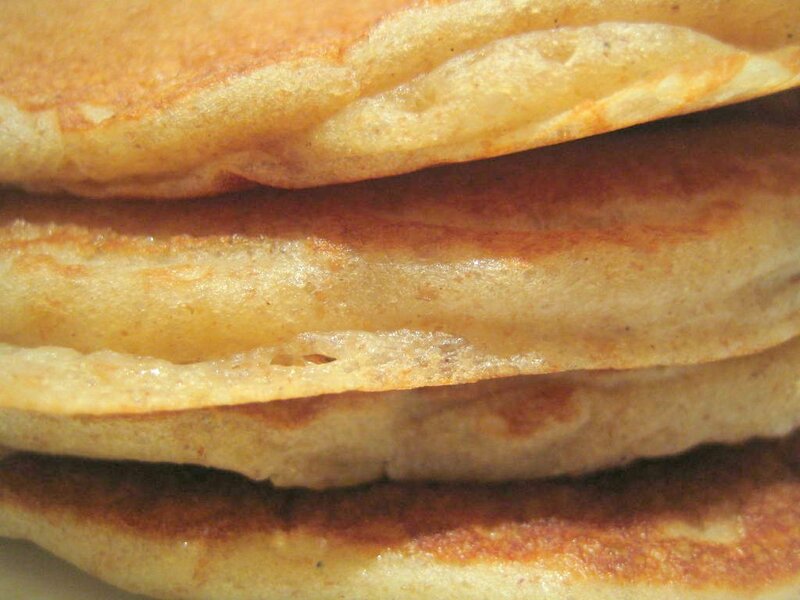 When you are ready to cook the pancakes mix the baking soda with the water and then mix into the batter. Leave for one minute to active the baking soda. Since the batter is acidic the baking soda quickly and powerfully releases its carbon dioxide. Pour some batter into the pan and cook until golden on each side, then transfer to the oven. I used about 1/3 of a cup of batter for each pancake. Serve in a stack with crispy bacon, maple syrup and, if you are me, a grinding of black pepper over the top. What a great breakfast! More information on sourdough can be found here. Those pancakes look so wonderfully fluffy. Pancakes and syrup are my absolute favorite sweet breakfast treat. Brilliant present that starter, got a loaf of sourdough in the over right at the moment! The pancakes are a great way to use some of the starter when it needs to be fed and you don't need bread. Make your own starter I did, just need 100% rye flour and a can of unsweeten pineapple chunks. 1/4 flour ( I still used the rye flour but unbleached white or wheat will work. If the mixture does not start to grow bubbly or nice sour yeasty smell by Day 6, add 1/4 tsp. apple cider vinegar with flour and water. From this point repeat day 4. I made a bigger batch at this point I was removing 1/4 cup discarding but adding 1/2 cup of flour and water. Reference if recipe asks for one package of instance yeast = 1 cup of sourdough yeast ( mix with 2/3 of the flour from recipe and all the water and let sit for 12 to 16 hours.) then after the rise add all the salt and other stuff. This is why I discarded less then I added so I could pickup day 4 with what was left over, day 4 and on your starter should double in size every 12 to 16 hours. I have read to feed your starter once a day or twice a day, I have done both works either way for me. I have put my starter in the fridge so I only need to do weekly or bi-weekly feedings, I did this after 3 weeks of daily feeding. also the pineapple juice is for the yeast to grow and mold not to grow.